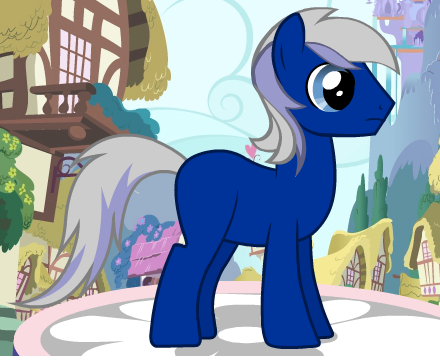 Personality: Azure Lightning has a nice personality and likes to meet new ponies, but has a strange feeling about new ponies makes him a little shy, but it does not bug him a lot. But Azure hates Timberwolves, and has strange nightmares about them and also about other ponies too. When he is off exploring he hopes some pony goes with him in case something bad happens. He also lost some memory when he was a Colt about his mom and where he lived but he has flashbacks about his life as a Colt. History: Azure Lightning was born and raised in Trottingham. He had a normal life as a Colt some ponies picked on him but he just ignores it. Azure grew up with his mom he did not know much about his dad cause he left his mom when Azure was a Foal. By the time he was a Colt his mom passed away from sickness, when Azure heard about the dead of his mother Azure felt destroyed. Azure became an orphan when his mom passed other ponies made fun of him saying it was his fault his mother died he just ignored the pain other ponies were saying to him. When Azure was almost a young adult he heard of a town called Ponyville, Azure wanted to go there to leave all the pain behind in Trottingham but to get bits he must work somewhere, so Azure deiced to work at a apple farm to get bits for his leave to Ponyville. Azure has a necklace his mother had before she passed away this necklace is everything to Azure and he wears it around his neck all the time and he hopes he won't lose it. Azure cutiemark means that he is brave and has courage also he has a strong heart who can't be taken over by darkness easy. Azure has little or no memory of his his mother passing away or where he lived the only thing he has is his mothers necklace. Other: He has flashbacks when he see something that looks like any about his past, He also has his mothers necklace and he wears it all the time but don't know how he got it.